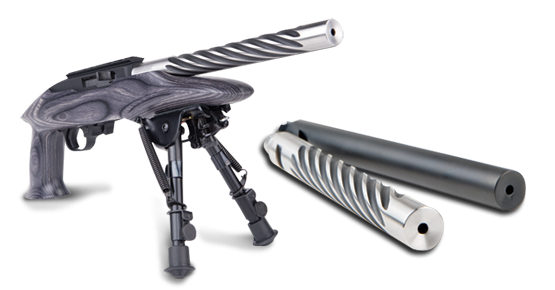 Drop in replacements for the Ruger Precision® Rimfire rifle (22 LR only). Some dimensions are slightly altered to give better fit to the receiver. Check them out on our online shop. Available in either .920" Bull or Factory taper, in 22 LR only. 16.5 or 18 inches in length. Available in either .920" Bull or Factory taper, in 22 LR only. 10.5 inches in length. *Add Fluting price to base price of barrel. Available for both .920 Bull and Factory tapers. 1/2x28 Rimfire thread pattern. *Add Threading price to base price of barrel. We do not produce barrels for Takedown models. All 10/22® and 22 ChargerTM barrels are machined with Bentz style target chambers. *NOTE REGARDING RUGER PRECISION® RIMFIRE MATCH BARRELS: These chambers are cut with SAAMI specification '22 Long Rifle - Match' chamber reamers. (Drawing available at SAAMI.org) This means that some ammunition will cause the bolt to close with resistance and that you may have difficulty removing unfired rounds from the chamber. The match chamber will cause the rounds to be pushed into the rifling. Be sure to use extreme caution and always keep the barrel pointed in a safe direction while chambering or removing a live round. "Ruger®", "10/22®", "22 ChargerTM", and Ruger Precision® are trademarks of Sturm, Ruger & Co., Inc. Neither Shaw, nor this website are affiliated in any manner with, or otherwise endorsed by, Sturm, Ruger & Co., Inc. The use of "Ruger®", "10/22®", "22 ChargerTM", and Ruger Precision® on this website are merely to advertise the sale of compatible components.